The William Henry Fox Talbot Catalogue Raisonné is a project compiling and sharing 'the complete corpus of the work of the Victorian inventor of photography on paper'. 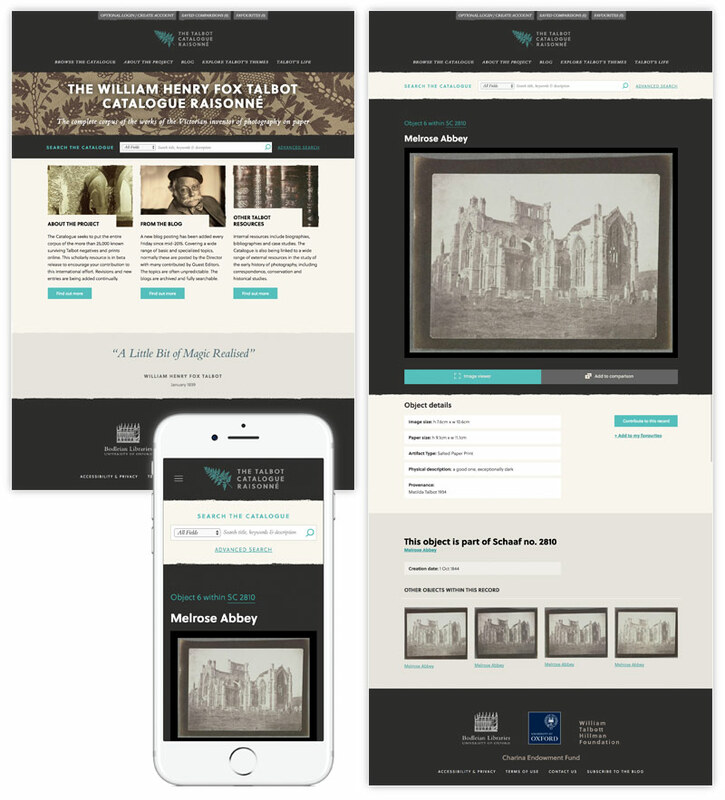 I worked with a team assembled by Bodleian Libraries to develop the previous WordPress-based blog into a responsive, modern website that not only carries ongoing blog content, but that also offers a huge archive of photographic images from Fox Talbot archives. From provided designs, and in partnership with the Bodleian's technical team, I created the front end solution for the website. It combines several strands of technology into a coherent, easy-to-use interface: WordPress, used for the content and editorial sections; Blacklight and Ruby on Rails, for the image archives and searching functionality; and Mirador, for IIIF-compliant image viewing and comparison. My work included a bespoke theme that seamlessly joins WordPress and Blacklight output, and custom coding for an in-browser image comparison lightbox, and for the transfer of data between the two back-end systems. The website allows Fox Talbot enthusiasts to search and compare hundreds of images, each provided with sufficient metadata to allow them to be navigated and searched easily. Since its launch, The William Henry Fox Talbot Catalogue Raisonné has received national media coverage.